I rolled up for a long weekend in Taipei, Taiwan without many plans beyond a long list of foods to eat.My first stop was checking into the luxurious Airbnb I’d booked (which boasted cable TV and a spacious, sunken bathtub) — only to find out I’d need to wait a few hours more for cleaning. I was just about to feel dejected when the cute Taiwanese guy who’d come to meet me on behalf of the host offered to take me to lunch and show me around the neighborhood. So, I stashed my bag in the building’s basement and we took off onto the vibrant streets of the Da’an District. He gave me all the scoop on the neighborhood, regaled me with tales of Airbnb guests who’ve come and gone, and bought me all the milk tea I could handle. When we finally stopped for a proper meal, he recommended the classic Taiwanese braised pork over rice and an oyster omelette. The omelette consists of oysters and vegetables cooked with egg and sweet potato starch, covered with a sweet chili sauce, and is absolutely delicious. The pork rice is a simple but unmistakeable quick meal in Taiwan. My first day in Taipei was such a success, I couldn’t wait to see what was next. It was straight to the night market once I was out on my own. 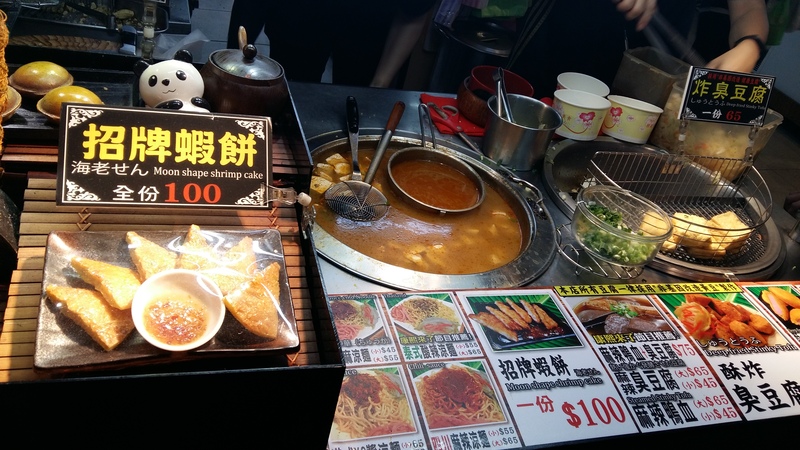 Taipei has a number of these bustling markets full of cool clothes and accessories, gadgets and, of course, amazing street food. I was immediately drawn to some fabulous-smelling barbecue pork concoction. 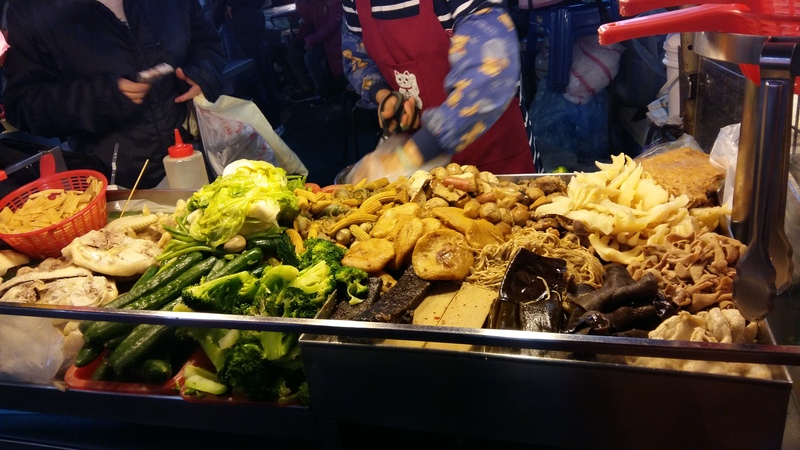 I watched some other foreigners order it with ease, but once it was my turn, I was somehow roped into a full-on conversation with the vendors in Mandarin Chinese. Which perhaps would’ve been cool if my Mandarin wasn’t limited to “thank you,” the numbers 1-10, and “I love you.” But the food was worth it — smoky barbecued pork stuffed with green onions and seasoned with pepper and other spices. Next up was some dessert! Or so I thought. 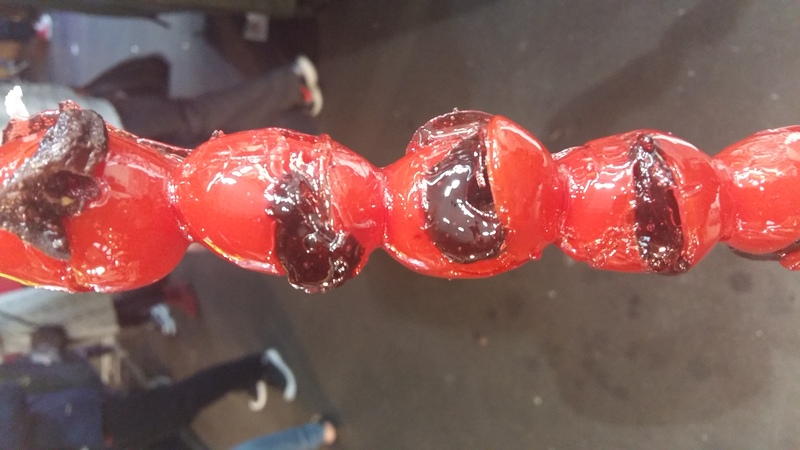 These columns of brilliant red fruits dipped in sugary syrup alluringly glistened under the warm lights of the Raohe Street Night Market, enticing me. But… they’re actually candied tomatoes and plums. I nibbled on the crunchy candy that coated the outside, but homie don’t play with tomatoes, and homie especially don’t play with tomatoes presented as dessert. I wish I loved this, but I guess it wouldn’t be a food adventure if I didn’t try something that I found completely strange. The next day, I met up with a friend from Korea to check out the Taipei Zoo. We grabbed some ice cream cones on our way to the train station. 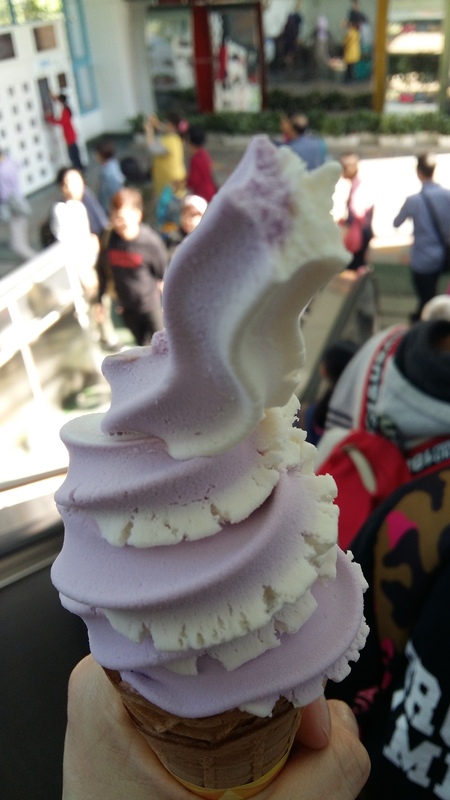 Mine was blueberry and vanilla swirled together, and was a more crisp consistency than typical ice cream. 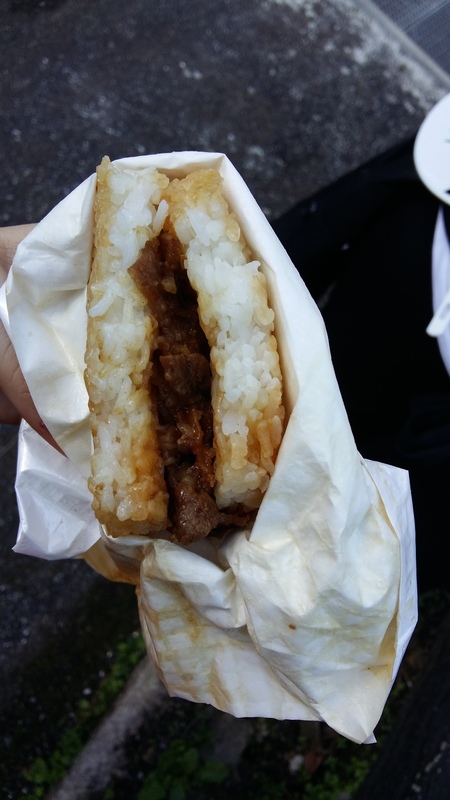 While starving at the zoo, I grabbed a rice burger — that is, pork sandwiched between two “buns” made from lightly-seasoned rice — and some cheese fries. After the zoo, we rode the Maokong Gondola and saw a total of zero stunning mountain views because it was too dark. But at least there was no line that late in the day. The best part of the ride was, naturally, the delicious street food that greeted us at the top! 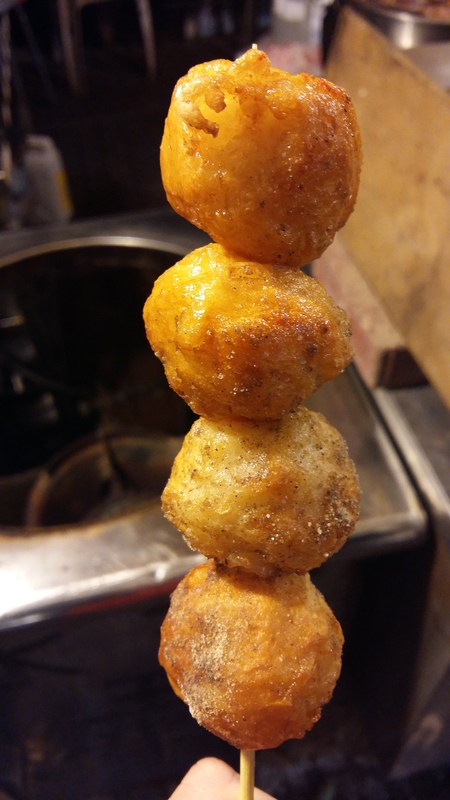 I immediately grabbed some amazing skewered sausages from a street vendor. These were one of the highlights of my food journey, actually. They were cooked to perfection and the flavors were so rich. And would it be Taiwan without some more milk tea? 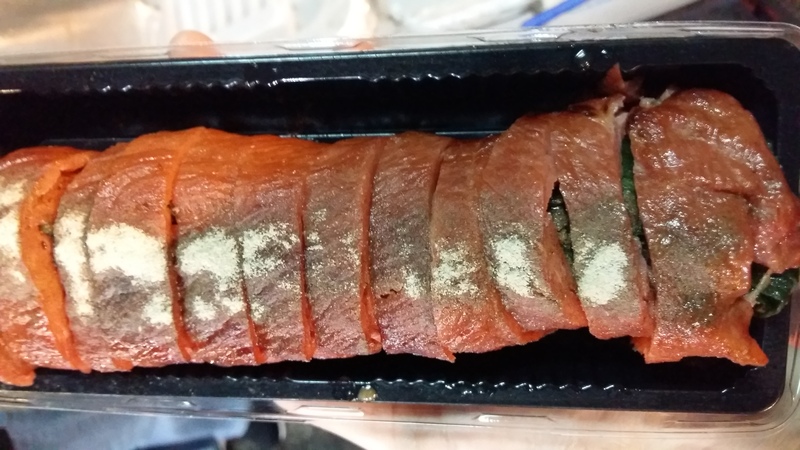 The one I bought in Maokong was slightly different, though. 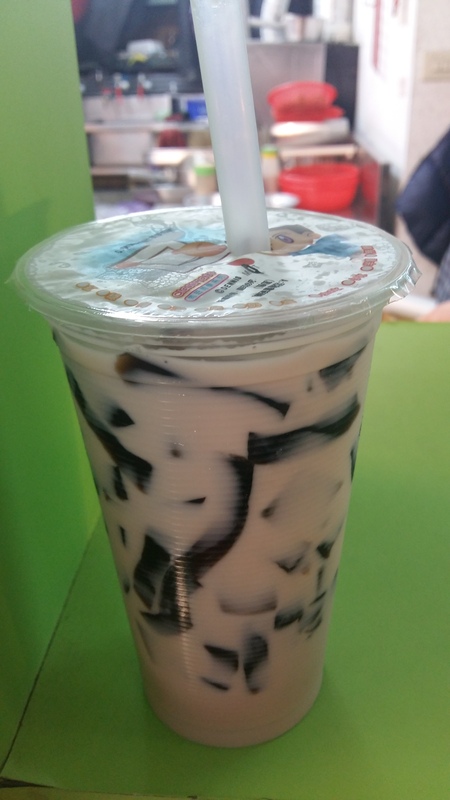 Instead of your typical boba tea with tapioca pearls, this one is served with cubes of chewy grass jelly. The jelly is made from a plant similar to mint and has a slight herbal taste to it that really enhances the delicious flavor of the tea. 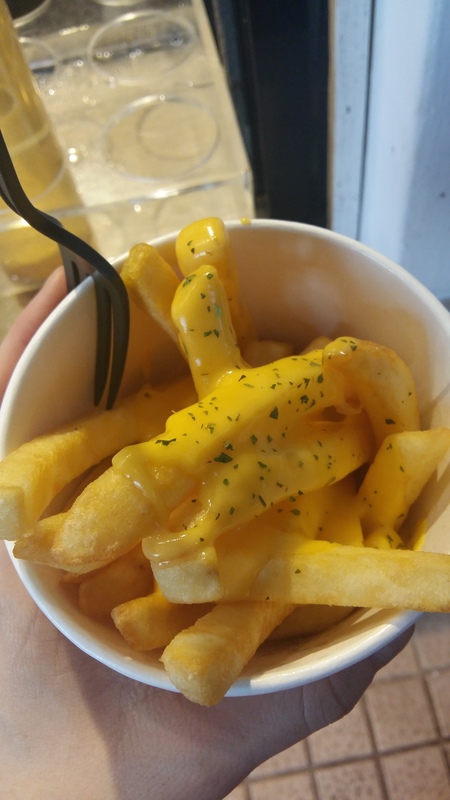 Prince Cheese Potato was at the very top of my must-eat list. It was actually a pretty essential deciding factor in planning my trip to Taiwan in the first place. 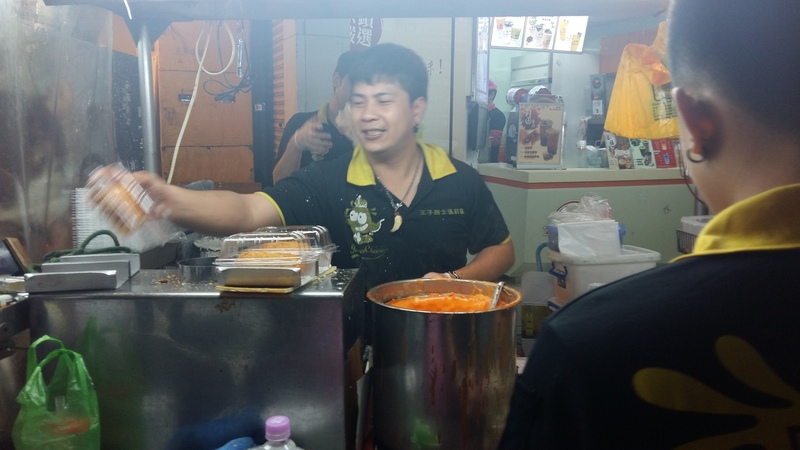 This famous stall at the Shilin Night Market stuffs its baked potatoes with all kinds of delicious toppings (including octopus, pineapple, scallops, chicken, tuna and German sausage) and then drowns them all in melty nacho cheese. It’s everything I’ve ever wanted. I ordered a Club and Cheese, one of the most popular menu items. 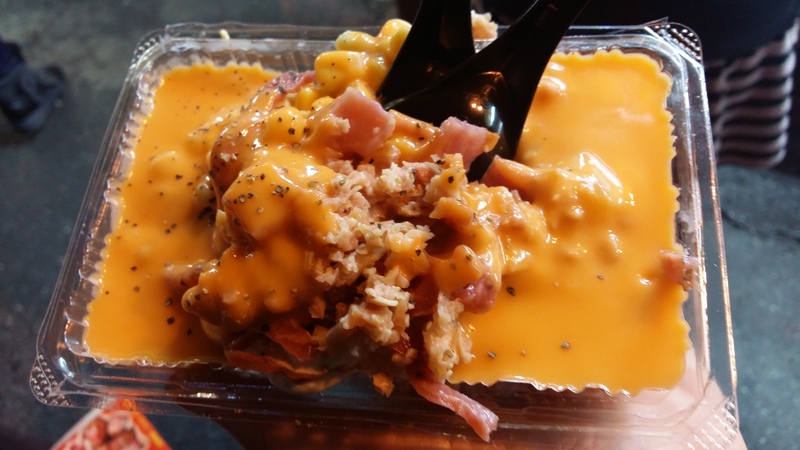 It’s a baked potato filled with ham, corn, egg, etc., doused with the trademark cheese sauce. Ah, it’s heaven. It’s well worth the trip to Taiwan, I promise. I love it so much. I want to marry this dish and become the Princess Cheese Potato. On my way home, I decided to make one last stop for some dessert in a random back-alley restaurant, and I’m so glad I did. This banana mango shaved ice treat was probably the best shaved ice I’ve ever had. 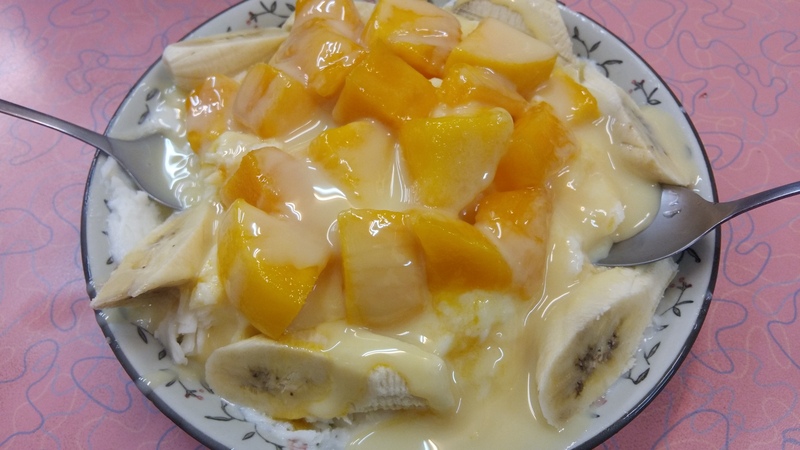 It’s similar to Korean bingsu — a refreshing dessert that often pairs thinly-shaved ice with fresh fruit and sweet syrup — except the Taiwanese version was swimming in condensed milk and was infinitely sweeter. It was so fantastic. And, just like that, the Taiwan adventure was over and it was time to head home. But there was one just more thing to eat. 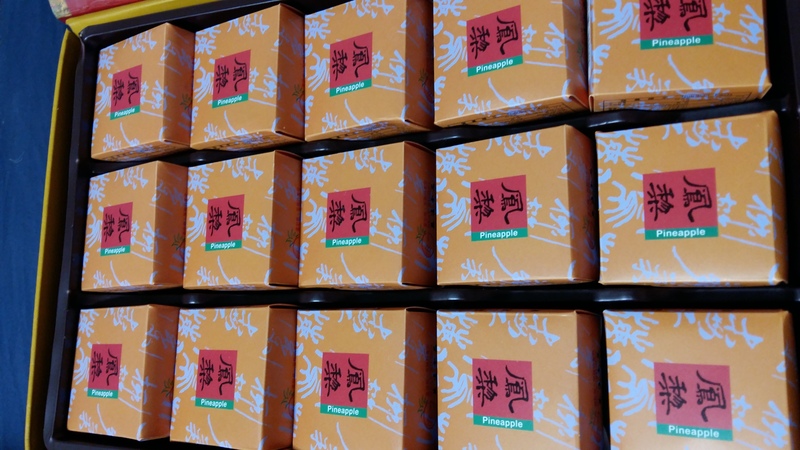 You cannot pass through a Taiwanese airport without getting some souvenir pineapple cakes to bring back for your friends. The small cakes are travel-friendly and famously tasty. The outside is flaky like a pie crust, and the inside is filled with gooey pineapple jam.I had a delicious and action-packed adventure in Taipei, and I just dream about all the foods I wasn’t able to try yet. Until next time, Taiwan! 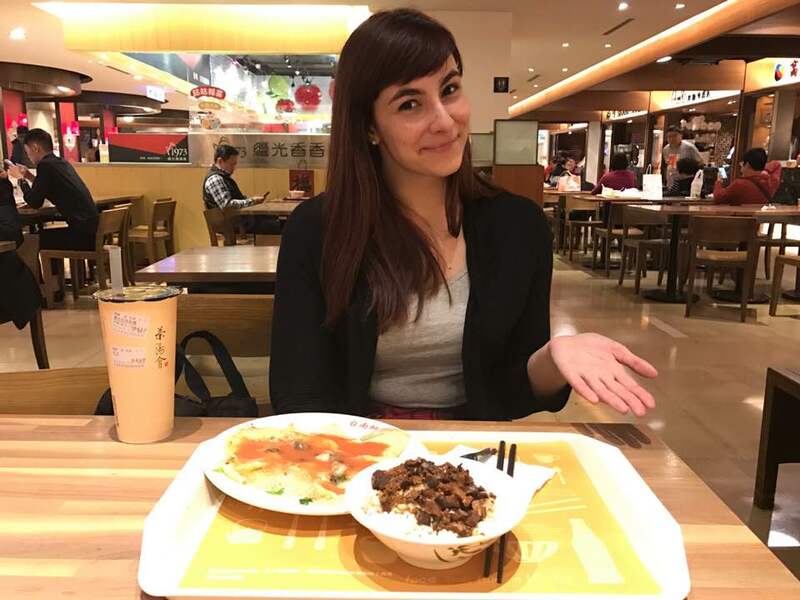 This entry was posted in Food, Taipei, taiwan, Travel and tagged airbnb, baked potato, banana, barbecue pork, bingsoo, bingsu, boba tea, braised pork over rice, bubble tea, candied tomatoes and plums, cheese, cheese fries, Da'an District, dessert, dining, food, grass jelly, ice cream, Mandarin, mango, maokong, Maokong Gondola, milk tea, nachos, night market, omelette, oyster, oyster omelette, pineapple, pineapple cake, plum, pork, prince cheese potato, Raohe Street Night Market, rice, rice burger, sausage, shave ice, Shilin Night Market, shrimp cake, skewered sausages, street food, Taipei, taipei zoo, taiwan, tapioca, tapioca pearls, tomato, travel on April 7, 2018 by screamfmlondon.